This is a clip edited and narrated by Alex Anderson, who also took the photos of the rejects at the end of the clip. Videotaping was done by Sam Comstock, Megan Parish, and Bernardo Martinez. My only contribution was some final tweaking of the video color balance and lighting to match up the two cameras and smooth up some transitions; otherwise, the editing is all Alex’s work. This is a representative sample of the kind of work you’ll see when these episodes are finally posted. I’ll post the samples for Synthetic Diamonds and Aristotle/Empedocles next time. After my presentation, Ron Brashear, the Director of the Beckman Center here at CHF, took me out to lunch. As we talked, I was surprised to find that we knew some of the same people. He had worked at the Huntington Library in California, researching Edwin Hubble’s letters and personal papers. As part of his research, he visited Mt. Wilson Observatory where Hubble did most of his work. I’ve been up there several times with the NASA Explorer School workshops that I did for JPL, and so we’ve both met some of the astronomers and docents at Mt. Wilson and we’ve both visited the Lowell Observatory in Flagstaff, AZ. It is a small world, as they say. I find, however, that as I have these opportunities to work in the science education and science history fields, that I increasingly meet the same people, or at least find that we have the same aquaintances. Academic and scientific circles become increasingly rarefied and specialized, but sometimes they intersect in interesting ways. One of the great privileges of my life has been to meet some of the best minds in several scientific disciplines, including space exploration, astronomy, and now science history. I’m not going to drop names here, but when comparing them to so-called “celebrities” I’ve met, the scientists are the truly great ones, the ones we should be holding up as heroes. My fellowship here at CHF has already helped me to make contact with some of these personal heroes and to at least intersect their circles, and that may be the best part of all for a science groupie like me. The other activity I’ve worked on is a Preliminary Proposal for an Informal Science Education grant from the National Science Foundation, which was due yesterday at 5:00. After writing with blazing speed (I hope it makes sense), I wrestled with NSF’s Fastlane submission system and finally hit the submit button a few minutes after 5:00, only to realize that I forgot to justify one of my budget entries – to provide stipends for time and equipment to the mentor teachers/schools of the participating teams. Hopefully that won’t be enough to kill it. I am submitting the Summary Page and the Project Description here for your evaluation. I would appreciate any feedback you can give. In this blog entry I’d like to discuss some of the ideas that I have been researching so far here at Chemical Heritage Foundation, report on a conference I attended last week, and give an overview of my plans for the next week. I’ve been conducting my research at CHF for about 2 1/2 weeks. So far I am on schedule for the topics I wish to cover while I’m here in Philadelphia. My goal for these first two weeks was to survey the theories of elements and atoms proposed by the ancient Greek philosophers, then use the third week to research how these theories were carried into the Middle Ages. I used to think that Greek scientific thought on the nature of matter could be divided into a neat dichotomy, with theories of elements (stoicheia) as proposed by Empedocles and Aristotle on one side, and theories of atoms as proposed by Democritus and Epicurus on the other. As I have dug deeper, however, I find that the issue isn’t nearly so simple. Not only did the Greeks theorize about the nature and structure of matter, they also looked at the nature of change, the origin and fate of the universe, and the underlying forces that drive it all. This creates whole sets of conceptual dichotomies. Attempting to sort through all of this while getting to know the personalities and lives of these philosophers has been a fun challenge. I can’t say I’m much of an expert yet, but I have enough to begin to put together a podcast episode on this topic, to be completed and uploaded by the end of August. At the risk of over-simplifying, here is what I’ve found: the Greeks were already thinking about where the universe came from and what it was made out of by the time of Thales of Miletus, around 585 B.C., who was considered one of the first philosophers (independent thinkers – “lovers of wisdom”). 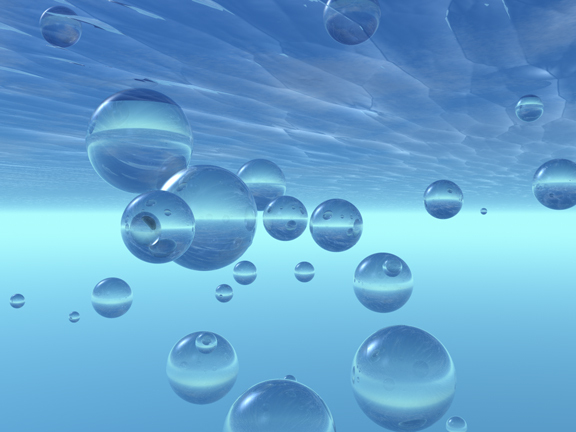 Thales proposed that everything was made of water, although his follower Anaximenes thought it was air. By about 500 B.C., Parmenides of Elea taught that change was an illusion, that the senses weren’t to be trusted, and that there could only be Being and Non-being. He denied the possibility of empty space (a void) saying it was a logical impossibility. His student Zeno, in a series of famous paradoxes, such as the one about Achilles and the Tortoise, showed that motion (and therefore change) was impossible. In contrast to the Eleatic School, Heraclitus of Ephesus taught that change was the only constant in the universe, that you can’t step in the same river twice because both you and the river have changed in between. He felt that fire, as a symbol of change, was the universal element. 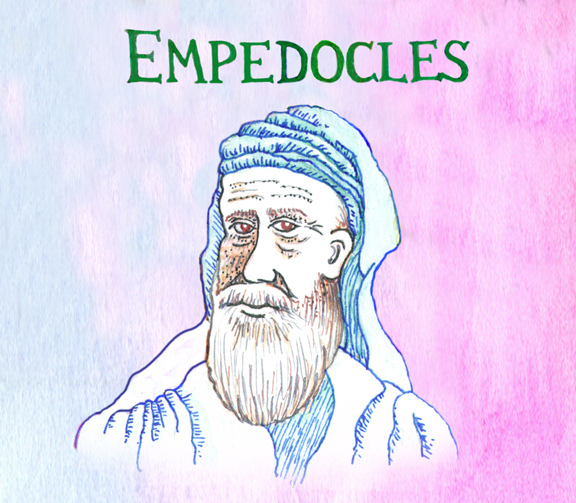 As a compromise between the extremes of Parmenides and Heraclitus, Empedocles of Akragas proposed that there were four elements (earth, water, air, and fire) and that although these elements were eternal and changeless, they could combine and break apart to form new materials. He felt that their were two opposing forces, what he called Love and Strife, which tried to bring the elements together or break them apart. 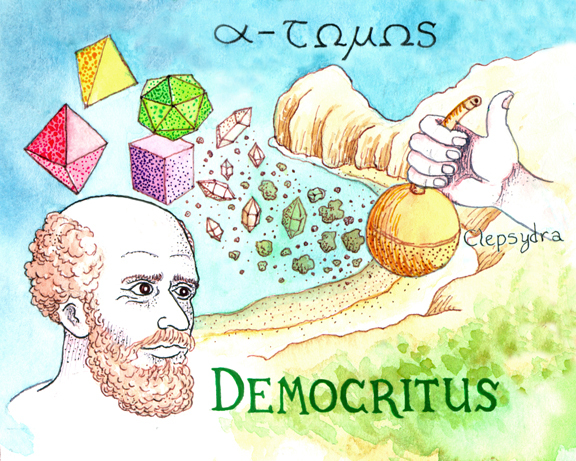 Also in contrast to the Eleatic School, Leucippus of Abdera proposed that all things were made of small, indivisible, unchanging atoms which traveled in a void, combined by the forces of a primordial vortex into larger clumps of matter. His pupil, Democritus, took these ideas further and said that nothing existed except atoms and the void, and that atoms combine from necessity (he was a bit vague on what this meant). Unfortunately, most of his original works (some 70 books) are lost and we know of them only from the references of others. One of those others was Aristotle, the pupil of Plato and teacher of Alexander the Great. 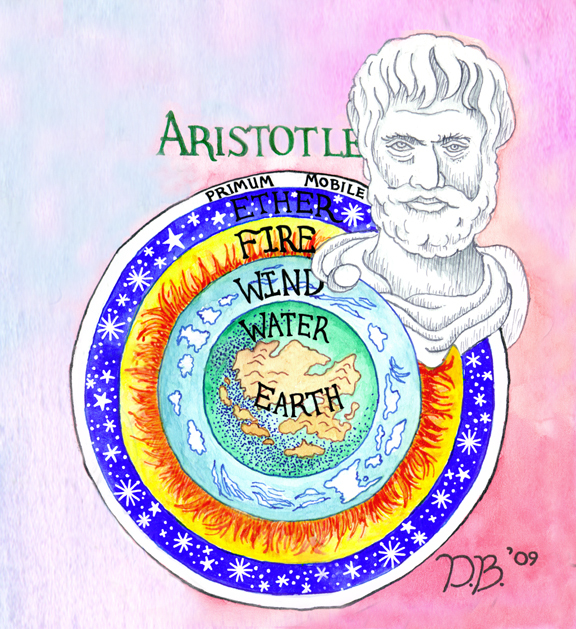 Aristotle tried to create a system of knowledge that tied everything together, including the material world and the heavens, and that explained the nature of change. Like his teacher Plato, he felt that there were ideal forms that created the patterns for all things, and that all things had purpose. 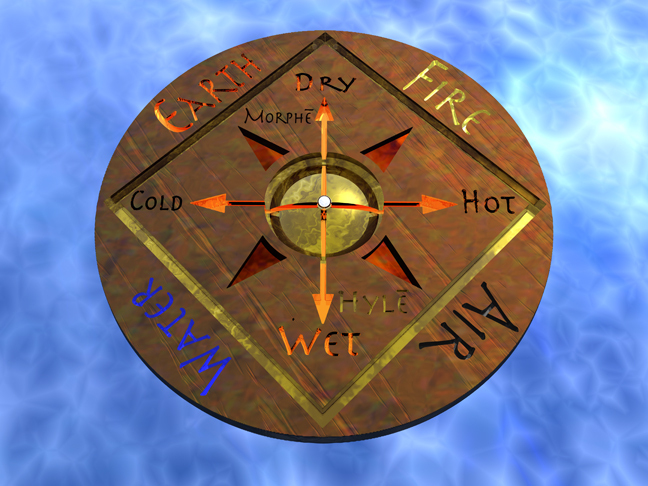 He taught that the primordial subtance (hyle) took on the forms (morphe) of the four pure elements, and that these elements had properties including hot and cold and wet and dry. All other materials were mixtures of these elements. By changing the properties of one material, it could be transmuted into another, such as base lead maturing into precious gold. He also felt that the elements were arranged in spherical shells with earth at the center, surrounded by water, then air, then fire. The heavy elements sank because of a force he called gravity and the lighter elements rose through a force called levity. Finally, he proposed that a fifth element (literally the “quintessence”) called ether surrounded fire and was the material from which the incorruptible heavens were made. Aristotle’s views were brought into harmony with the Catholic Church by the Summa Theologica of St. Thomas Aquinas. 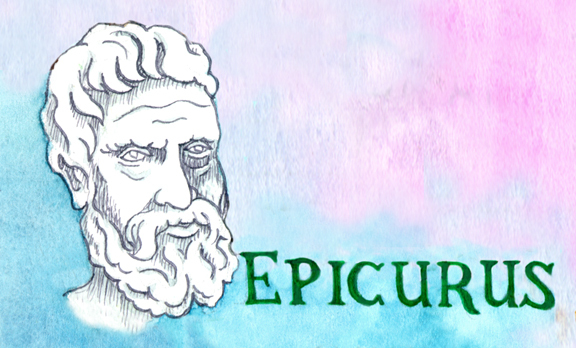 Democritus’ views on atoms were supported by Epicurus and therefore seen as too materialist and hedonistic by the church, and they fell out of favor (but never entirely died, as I’m finding out this week). It wasn’t until the Enlightenment that atomic theory began to revive. Now, of course, this is a very simplistic overview. I’m in the process of writing this all up in more detail, including some interesting though apocryphal stories of the philosophers, for a podcast episode of The Elements Unearthed. I’ll be presenting this information, and giving an overview of the project, at a Brown Bag Lunch next Tuesday, June 23, from 12:00 to 1:00 here at Chemical Heritage Foundation (315 Chestnut St., Philadelphia). The public is invited, so if you’re in the area, please stop by. It will be in the 6th floor conference room. I will have some samples of animations and images with narration for this new episode, as well as previous episodes created by my students at MATC and a presentation on the project as a whole. One final note from this last week. I had the opportunity to attend a conference entitled “Composition to Commerce: Chemistry, History, and the Wider World” held June 12-13 at CHF. It was set up as an opportunity to hear experts in the field of chemistry history present some of their current work and to discuss the historiography of chemistry; that is, how one goes about telling the history of chemistry. Although I felt myself to be a bit of an interloper, I was excited to find that some of the best experts in the field were there – people like Lawrence Principe, William Newman, Alan Rocke, Ursula Klein, and others. In my researches here I keep coming across their names. I didn’t get the chance to talk to all of them, but at least being there and seeing them lets me know who they are. I hope to enlist their aid in this project, perhaps as Subject Experts on alchemy and the history of atomic theory that I can interview later this summer. I also found the conference interesting in how various historic alchemists/early chemists were treated and how some names I’d never heard of are now surfacing as having had an important impact on the history of chemistry, such as Gassendi, Sennert, Starkey, and others. I’ll enjoy getting to know their stories as well as the those of the better known figures such as Boyle and Lavoisier. Anyway, wish me luck on my presentation next Tuesday. Stop in if you can. After that, I must dig into revising my application for the National Science Foundation which is due on Thursday. But more on that next week . . . .
Last week I drove 2300 miles from Utah to Philadelphia to take up my three-month residence at the Chemical Heritage Foundation. Today I’ll describe more about what CHF is, how I came to have this fellowship, and what I will be doing with it. 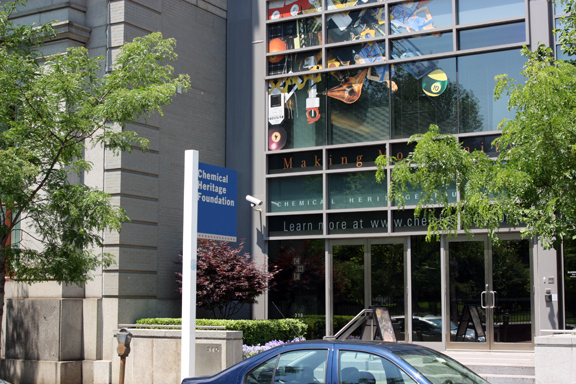 The Chemical Heritage Foundation was established as the Center for the History of Chemistry in 1982 at the University of Pennsylvania with support from the Americal Chemical Society (ACS) and later from the American Institute for Chemical Engineering (AIChE). In 1987 it incorporated as the non-profit National Foundation for the History of Chemistry, and in 1992 it was renamed the Chemical Heritage Foundation. In 1995, the foundation purchased the old First National Bank building in downtown Philadelphia, having outgrown its space at the U. of Pennsylvania. Today it has several divisions and research arms, including the Othmer Library of Chemical History which houses over 100,000 titles including journals, reference books, portraits, photos, oral histories, and even scientific instruments. It also houses the 6000 titles of the Roy G. Neville Historical Chemical Library, a collection of rare books from the 15th Century and later, some 400 titles being unique to this collection. The Beckman Center for the History of Chemistry manages the research of visiting scholars and fellows at the library. 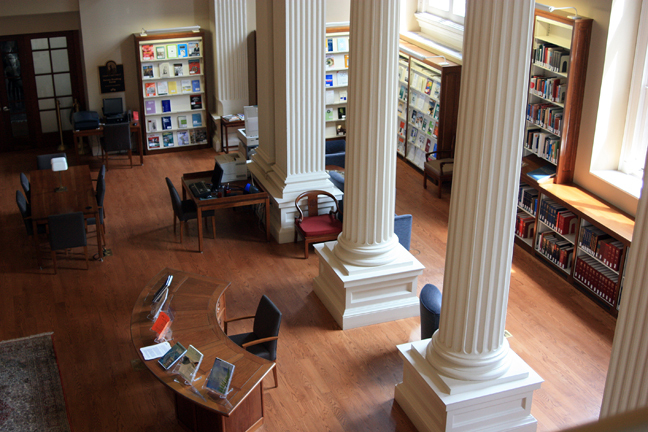 The Reading Room at CHF. In addition to the holdings in the library, CHF has museum spaces and exhibits and a convention center/meeting hall. The First National Bank building was rennovated and turned into museum space which opened last fall for the permanent exhibit called “Making Modernity,” which is a collection of instruments and artifacts that helped define the rise of chemistry as a science, with everything from samples of ancient Roman and medieval glassware to 20th Century pH meters, electron microscopes, and mass spectrometers. They also have changing exhibits such as “sLowlife,” a look at the adaptations and movements of plants; “The Whole of Nature and the Mirror of Art: Images of Alchemy” which is a series of photographic reproductions of illustrations from medieaval manuscripts; and “Transmutationa: Alchemy in Art” which displays paintings of alchemists by various artists. CHF also has traveling exhibits and the Ullyot Meeting Hall for conferences and conventions. It is a unique space for such meetings, since we are located right in the historical district of Phildelphia at 315 Chestnut St., diagonal to Carpenter’s Hall (where the First Continental Congress met in 1774) and just two blocks down from Independence Hall. 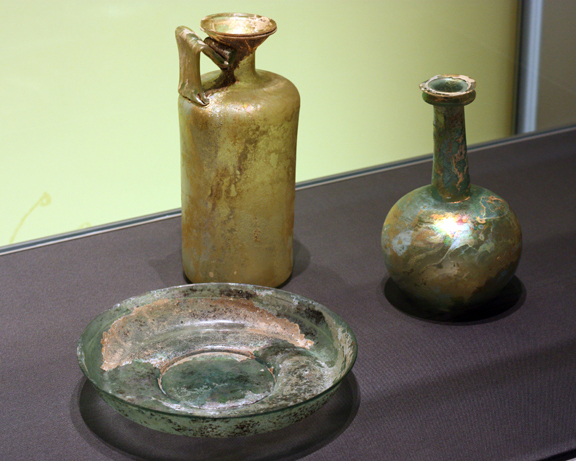 Roman glass display in the "Making Modernity" exhibit at CHF. The fellowships and travel grants managed through the Beckman Center are provided by the donations of individuals and 3rd party organizations. My fellowship is sponsored by the Societe de Chimie Industrielle (American Section), which has as its mission to provide better public understanding of the chemical industries, which is precisely what my project intends to do. I found out about this fellowship while researching grants about 18 months ago, and before that had not heard of CHF. I didn’t think I would qualify, since I don’t have a PhD or a disseration, but then I read the requirements for the Societe fellowship and found I might just qualify. I wrote a proposal and asked two people who know me and my work to write letters of recommendation, and sent the whole in by e-mail in Feb., 2008, thinking my chances were slim. When I received an e-mail from CHF in April, 2008, I wasn’t able to read it at first because it came into my inbox as Chinese characters. I assumed it was the “thanks for your application we had many great applicants sorry we can’t accept all of them” and so on letter I’ve received before. I hit the reply button so I could get the Chinese translated into English and was amazed to find out this wasn’t a rejection letter at all. I had been selected! What remained was deciding when I would be here. My term of appointment is September 2008 through August 2009, but in discussions with my managers at MATC, they were not willing to let me take a sabbatical, especially in the fall when classes were beginning. Finally we compromised on this summer, the last three months of my fellowship term, when I would have fewer students to leave at MATC. They gave me such a difficult time about it, however, that I decided perhaps the time had come to leave MATC, which I have now done. Painting of an alchemist in the "Transmutations" exhibit at CHF. During my three months here, I will be conducting background research into atomic theory and its origins and development through the Middle Ages until revived by Dalton and others. 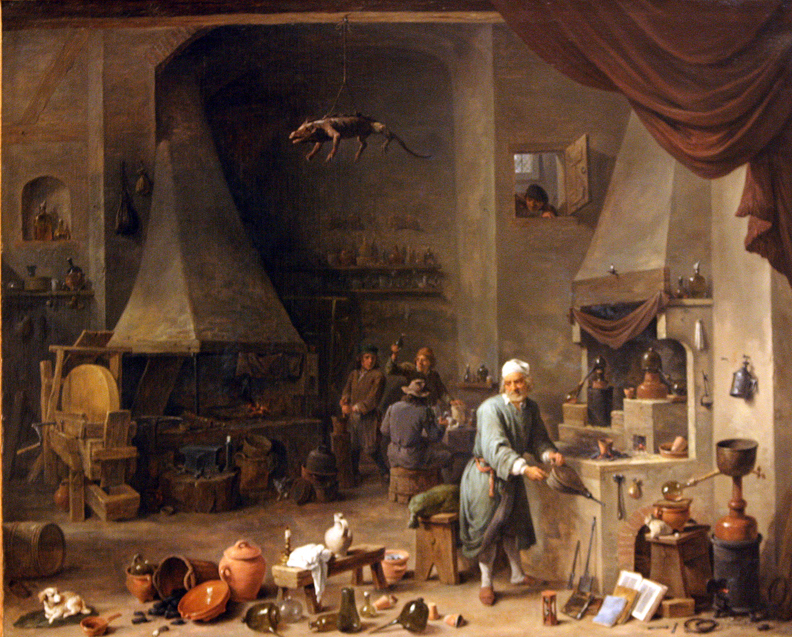 I’ll also be looking at the instrumentation and labware of alchemists and chemists through the ages, and anything else that might be useful (there are some great reference works here, and those oral histories). Basically, this will all become background material for The Elements Unearthed, with images and information used to provide historical depth and richness to our project. I hope to take the illustrations of labware that I find, for example, and turn them into 3D models and animations, perhaps re-create entire laboratories of famous chemists. For all this work, this is the place to be; no other library has so much information specifically related to this project, and this fellowship comes at an ideal point to move into Phase II. I am very fortunate to be here, and so far I am being treated very well indeed. My goal is to not only use my time here to finish editing the students’ projects into final video podcast episodes, but to create several new episodes based on the information and images I acquire here, so that about ten episodes will be ready for uploading at last by the end of August. I’m going to stuff as much information as I can find, as many photos as I can get, into a hard drive and use them over the next several years as the project develops. I can’t afford to waste any time, so I’ve set up a detailed research schedule and so far I’m following it well, with some wonderful new information about Democritus and Aristotle that I didn’t know before. I’ll share more of what that is and how my research is going in my next post. As mentioned in my last post, I am leaving Mountainland Applied Technology College and will be taking up a Fellowship at the Chemical Heritage Foundation in Philadelphia. I have been selected to be the Societe de Chimie Industrielle (American Section) Fellow for 2008-09 at CHF, where I will be studying the history of atomic theory, chemistry’s development as a science out of alchemy, and the types of labware and equipment used during the Middle Ages and later. I’ll discuss more about how this fellowship fits into the larger project in future posts, but in this one I’d like to give a final report on Phase I of the Elements Unearthed project as well as describe my four-day drive across the country from Orem, Utah to Philadelphia, PA.
My students at MATC have completed as much of their projects as was possible before the end of the school year. They are all in a rough cut format, with only the audio tracks laid in in some spots (narration only or audio from our wireless microphone system). In other places, we have video as well but it needs to be color balanced. Other spots have some images but so far the cuts are rough and the story is also. We showed these rough edits in an Alpha test before other students at MATC and had them fill out evaluation forms. Most of the comments were that they liked the information and presentation so far, but that they were too long, a bit dry, and needed more images and animations. This is to be expected when the rough cut for the blown glass project, for example, is 43 mintues long not counting credits. It is my goal to cut it down to two podcast episodes under 15 minutes each, so roughtly 1/3 of the material must go while keeping the storyline intact and improving the video, audio, and imagery. That will be part of my work this summer, to prepare these segments for Beta testing and final deployment on this blog and to iTunes, YouTube, etc. Overall the students did very well, learning not only how to plan and execute a video shoot, but also how to research and structure a documentary-style video, how to capture and transcribe the footage, and how to edit the footage using Final Cut Pro. If we had more time, they would have continued the process through beta test, whereupon I would have taken over for final editing. But the year is done, the Media Design Technology program at MATC is now cancelled, and I am in Philadelphia. It has been quite a trip. I had four days to make it to Philly, leaving at 9:00 a.m. on Thursday, May 28 and averaging about 550 miles per day. That’s about nine hours of driving each day, and I am certainly feeling the effects of it now. I took I-80 most of the way, only moving over to I-76 at Youngstown, Ohio. Fortunately the trip went by without major incident. The only bad thing was that one of my contact lenses decided to pop out at about mile marker 80 in Illinois. I pulled over onto the next exit and searched around for 20 mintues before finally finding it. 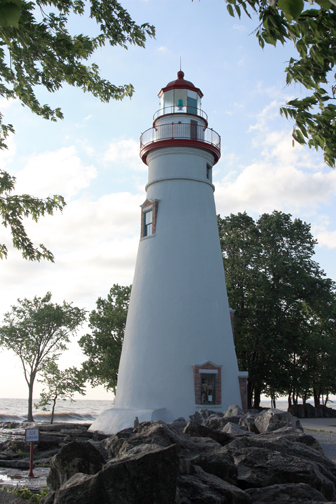 I stayed the first night at Little Thunder Campground on Lake McConaughy, NE; the second night in a motel in northern Davenport, Iowa; and the third night at East Harbor State Park at the tip of Sandusky Pennisula on Lake Erie in Ohio. I had planned out these stops carefully in advance (Google is wonderful!) and everthing worked out – I arrived at the Drexelbrook Apartments in Drexel Hill, PA at 4:30 eastern time on Sunday, May 31, just in time to sign the rental contract. My wife and children will be flying in today. Even though I was driving, I wasn’t taking a vacation from this project. I took a few detours and took a lot of photos both of scenery and of things related to the Elements Unearthed. One thing I noticed was how energy production technology is such a large part of our landscape. Near Rawlins, Wyoming, for example, is the large Sinclair oil refinery shown here. 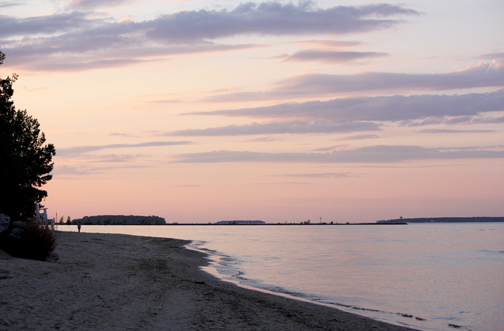 Lake McConaughy in Nebraska is not only an irrigation lake but generates hydroelectric power. It is becoming all too apparent that neither of these technologies can sustain our energy needs – the sites for hydroelectric power have pretty much been maximized already and crude oil has already passed the point of peak production in the last several years. We are running out of crude oil, and the prices will only escalate until we are well past the high price point of last summer. The average price I found crossing the country was about $2.50 per gallon, and it won’t get better. On an encouraging note, I noticed a huge increase in wind powered generators. New wind turbines are sprouting up all along I-80 and more are being constructed; I saw new turbine blades on the backs of several 18-wheelers as I traveled. 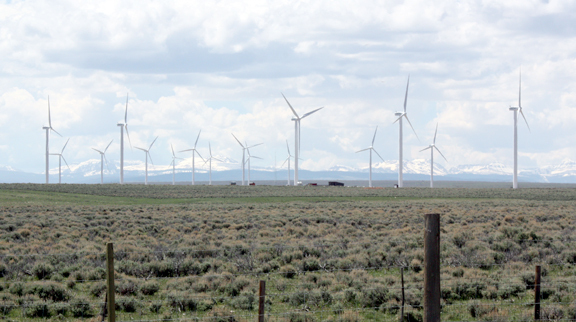 There was a new wind farm just west of Evanston, Wyoming and groups of turbines here and there across Nebraska, Iowa, Illinois, Indiana, Ohio, and Pennsylvania. Certainly wind is a largely untapped resource, and with new composite materials the turbines can last much longer and generate more power than the first generation of turbines that were installed in the late 1970s. 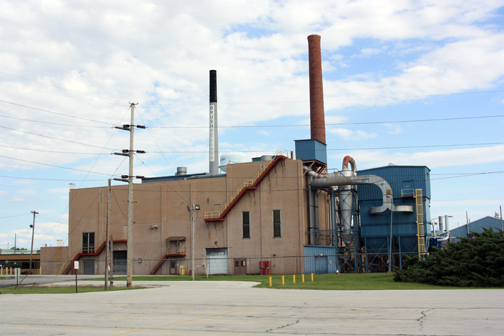 Another stop I made was at Elmore, Ohio where Brush Wellman’s Engineered Materials Division operates a plant that refines beryllium hydroxide pellets into final beryllium metal and alloys. The pellets themselves come from the concentration plant near Delta, Utah which my students have already documented (you’ll see the final result by the end of August). Coincidentally, U. S. Highway 6 runs through both towns, and coincides with I-80 for some of its length. It was good to finally get some decent photos of the Elmore plant to add to the beryllium project. Now that I am at CHF, I will begin pulling together all the images and other media that I can to tell the background history of the elements – something that my students couldn’t do very easily because there aren’t comtemporary sources or sites that we could go to and film. So this part of the project has to be done by me. Questions I hope to answer are how the Greeks first proposed the ideas of elements and atoms and how these ideas developed through history. I also hope to digitize illustrations and portraits of laboratories and equipment, with the goal of re-creating this equipment in 3D, perhaps even re-building historical laboratories such as those of Lavoisier or Priestley. I hade my orientation yesterday (June 1) and today I will start my researches in earnest. In my next entry, I wll describe CHF and its parts and functions and the resources that are available here. I am already finding it to be an incredible place for anyone that has a passion about the history of science.